Welcome to Broad Oak Park Allotment in Bexhill! 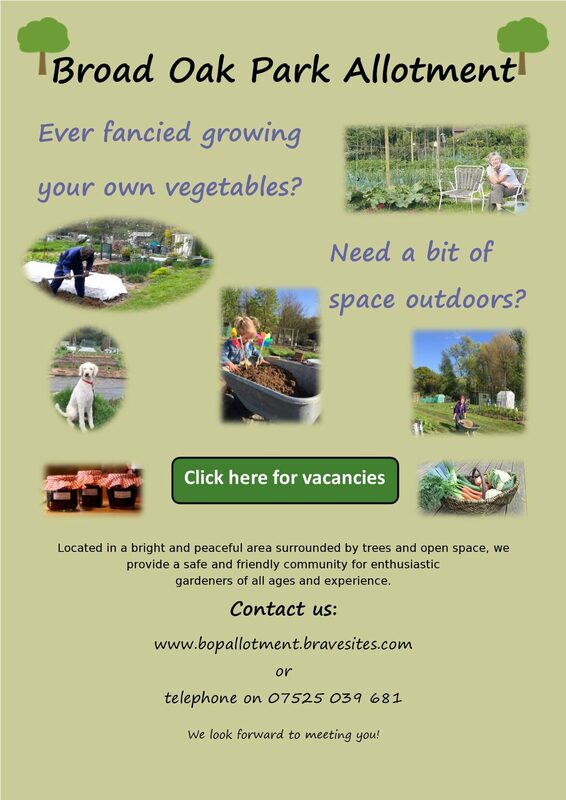 Hello and welcome to Broad Oak Park Allotments in Bexhill! Formerly a council run allotment until very recently, we are pleased to announce we have taken the reins and the allotments are now managed by the Broad Oak Park Allotment Association. As the name of our allotment suggests, we are located in a bright and peaceful area surrounded by trees. We aim to provide a safe and friendly community environment for enthusiastic gardeners of all ages and experience. Indeed, in time we will provide sheltered, communal areas where plot holders will be able to get together over a cup of tea to discuss what each is growing, offer advice to those who may be seeking it or exchange excess produce and seeds. But for now, we would encourage any old-timers or new-comers to just saunter around the site, talk to each other and get a feel for it. We will also keep you up-to-date on what's happening using our on-site noticeboard and the blog on this website. Please feel free to share ideas and comment in a friendly manner on any content on the blog. If you are interested in taking up a plot on our land please do contact us, using the details on this website. Vacant plots can be identified under the info-hub. We look forward to hearing from you.